I looked at that and it seemed kinda high to me. How much would that knife sell for normally? Hinderer knives are expensive, like $500 and up. Package also comes with 200 rounds of 300 BLK that are nickel plated black . Bingo, and this is a super rare Hinderer...he has never done a real collab with another company, nor has he done a completely black knife (hardware and all). A smart person would realize that even if they don't want the knife they could sell it online immediately and walk away with an Omega suppressor and 200 rounds of ammo for $700-$900, maybe less. ^ this post = arfcom catnip. How is this Omega different than the normal one? And why in the world would I want a $500 pocket knife? i will tell you like I told my coworker when he said that why would I buy a $400+ knife when his 40$ can do the same. "I would explain it to you, but you still wouldn't understand." If they catch you with that cell phone... Well let's just say it's against institution policy to have internet access. On the open market this knife would sell for $800-$1000 or more, not $500, but buy it and find out. If you don't think it's worth it, sell the knife and enjoy the amazing price you paid for a great silencer. Get offended all you want but it's true, you'll never understand. I think an XM-18 (particularly with that blade profile) goes for $700-$800 easy. It's not a bad deal, I'm sure the Hinderer fans would gush over than knife. Nick, is this collaboration your project? You guys make beautiful, well-built and functional products with excellent customer service. I just can't see letting any of these limited run items sit in a display case so they retain their value. ETA: I own expensive knives, but they all get used. At first I was like , but after some of the post. I guess it's more like . Still, $1695.00 and the $200.00 for the tax stamp. So roughly $2000.00. Seems pretty expensive, I bet your kinda forget after you have the knife and silencer in your hand. Yep, I own all the Summit line collaborations at SilencerCo. This one is unique in that we are trying to blend knife culture with gun culture, which is an interesting challenge. Before I met Rick Hinderer I was like many (most?) gun owners in that I would happily spend $700 on a new Aimpoint, $300 on a SureFire light, $1000 on a silencer, all to put on my $2000 rifle that sits in a safe 99% of the time, but I thought it was insane to spend more than $100 on a pocket knife that I carried all day everyday. In hindsight it seems a bit silly, so in an effort to enlighten our fellow gun enthusiasts to the world of quality knives, we created this package and set the price at a point where there is no way you could purchase the suppressor, ammo, and knife individually for less than the cost of the package. 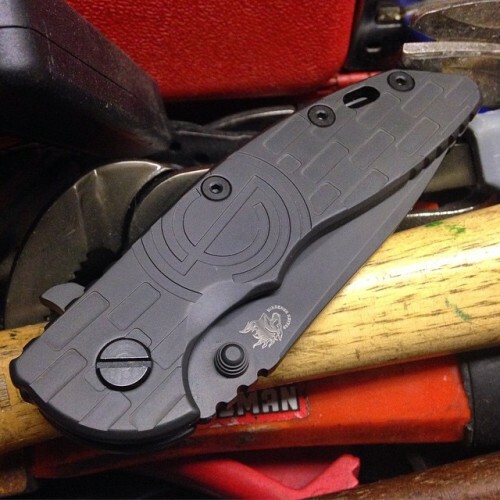 We're getting beaten up by Hinderer fans pretty heavily right now to sell the knife alone, so worst case, if the knife isn't for you there are plenty of knife enthusiasts with cash in hand willing to take it off your hands! Check out some of the Hinderer knife prices here: http://www.arizonacustomknives.com/Rick-Hinderer.aspx and here: http://www.knifeart.com/rickhinderer.html $500 - $700 for his basic production models should give you a little indication of what a limited edition would sell for. Don't get me wrong, if I had the cash I'd be all in. Nick, I think i'm about to order this bad boy. Thank you. ETA: Who doesn't love silencerco and a nice knife? You mentioned only selling the knife as the Summit Package. What about the Rifle Dynamics AK Package. Are there any plans to sell the rifles separately? I already have an omega incoming and Specwar so I really just want the rifle. My problem is I would buy this package with full intentions of selling the knife. But then I wouldn't and my wife would use it to slab me in my sleep. So I just went with the can and called it a day. The ammo looks pretty neat. Any idea how the special brass would stand up to reloading? I have a couple Hinderer knives that I rotate into my EDC (every day carry) collection and they are phenomenal knives. I wish I had the scratch to buy into this.....(I would buy the knife from anyone who gets the package). Nice!!! The knife really did turn out great. The projects we currently have planned all include a suppressor, but you are not the first to ask the question, so we will definitely discuss the possibility. That said, if you haven't shot an Omega yet, trust me when I say you're definitely going to want the complete package! Good question - I'll see if I can get our R&D guys to reload a couple to get you a better answer. If I order this package do I get the knife and ammo right away while waiting for the stamps? Somewhere I saw that you'd have to work that out with your local transferring dealer. Achievement Unlocked: I have now reached Silencerco fanboy status. Everything will ship together to your dealer, but there is absolutely no reason you couldn't take the ammo, knife, and display box home with you immediately. Haha! You going to order one? Currently in a debate with the spousal unit as to how "necessary" this purchase is. Eta: I already have a specwar 556, 30p-1, and 5 form 1's all in jail right now. So, I'll fight the best fight I can. I bought one anyway. Sometimes it's easier to ask forgiveness than permission!!!! Tell her you want one of the Summit line AKs first, then compromise on the Blackout package instead. It's all about strategy!